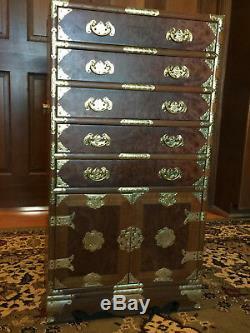 This is a quality teak and burl wood veneer chest with brass motif handles and edges. 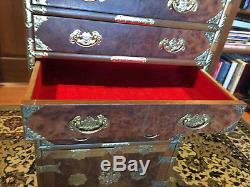 The 5 drawers are lined with red velvet, are dove-tailed and sturdy. 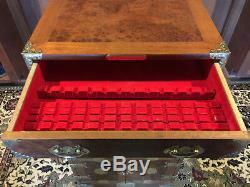 Included are the original 5 red velvet knife holders, they are movable to any drawer. 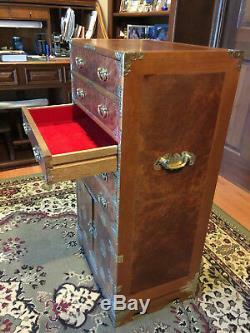 The cabinet below is excellent for larger items and closes with a brass bolt. Measures: 37.5" high x 14" deep X 20 wide. 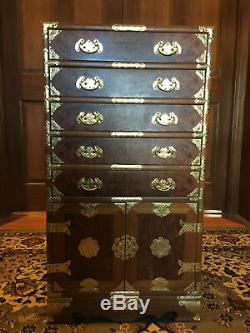 Lower cabinet: 12" deep x 18.5" wide Each drawer: 2.5" high x 11" deep x 18.5 wide. 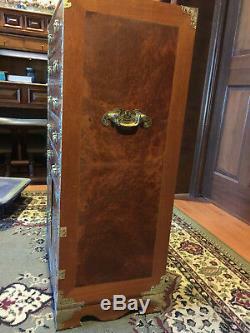 The item "Chinese Silverware Teakwood Chest or Jewelry/Lingerie Chest" is in sale since Sunday, July 15, 2018. This item is in the category "Collectibles\Cultures & Ethnicities\Asian\1900-Now\Chinese\Boxes". 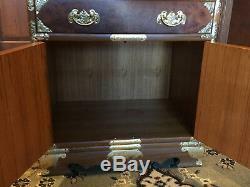 The seller is "a45621g" and is located in Denver, Colorado.